On 7th April our very own Jan Healey ran in the Derby 10k. 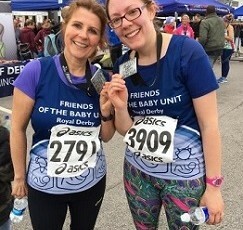 Jan ran with her niece Katherine, who is also an Occupational Therapist, to raise money for the Derby Hospital Special Baby Care Unit. As of the 8th of April Jan had raised £150 for the SBC Unit and would like to extend a big thank you to the Able 2 family for their support! Jan didn’t just rely on sponsorship to raise funds however! Cakes were also sold in the Able 2 head office to great success, although we are unsure as to who tipped her off regarding our fondness for cake! Both are pictured with their medals and, dare I say, looking more than ready for another 10k… Well done ladies! !